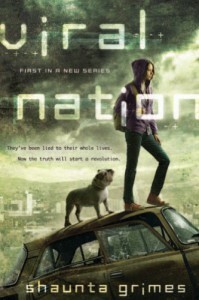 3.5 stars: Viral Nation is the first dystopian book I have enjoyed in a long time.Viral Nation opens with a virus wiping out most of the world's population. I love a good apocalyptic virus so I was captured by Viral Nation right away. A suppressant for the virus was discovered when the main characters were very young so the focus is much more on the power held by the company who controls the suppressant than on the virus itself.The main character (Clover) has autism which instantly sets her apart from all of the other YA characters I have ever encountered. Most of the characters were quite likeable, and since Viral Nation is the first book in a series, I get the impression we will learn a lot more about the "Freaks for Freedom" as the series progresses. Clover also has a service dog that assists her with her autism. I loved that. Even more so, I loved that Shaunta Grimes did not use the dog to toy with my emotions.I'm excited that there is time travel in this series, but it doesn't work well for me yet. 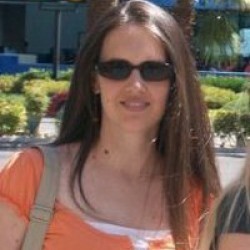 If I think about it too hard, I get a headache, but I was able to let go and just go with the flow most of time. In fact, I found Viral Nation pretty hard to put down.As with most YA series books, I wish I would have gotten more of a complete story out of Viral Nation. That is starting to be a pretty huge gripe with me, but nevertheless, I am anxiously awaiting the next book and will definitely be carrying on with the series.